Refusing to believe Apollo is dead, Starbuck gathers some recruits to investigate the scene of the Cylon crime. Starbuck asks Commander Adama for permission to put together a small crew to investigate Apollo's alleged death and bring him back if he's still alive, but he is denied. He and Athena therefore decide to go anyway, with some help from their friends; Countess Sephoni also agrees to help them, wanting to make amends for her psionic error (in "The Death of Apollo" Part 2). Starbuck, Athena, and Sephoni make off with a captured Cylon transport, accompanied by Boomer, Sheba, Greenbean, and Breena in their Vipers. While the Vipers temporarily hide in a nearby asteroid field, the transport approaches the super-basestar, then lands aboard as the Vipers draw the attention of the Cylon Raiders. Exiting the transport, the three begin a firefight with a hoard of centurions in the hangar bay. 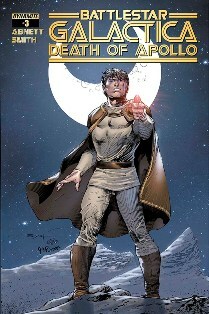 Cover D by Ardian Syaf mistakenly depicts stars in the dark portion of the crescent moon behind Apollo! On page 1, Adama's quarters have been redesigned a bit from how they appeared in episodes of the TV series. Notice that there somehow seems to be a portal looking out into space on the wall right next to the entry door instead of the pair of monitors normally seen. On page 2, Adama tells Starbuck that Xam's writing of Apollo's name may have just been due to a dream or an ideo-psion. "Ideo-psion" may be the Colonial term for a "viral meme". On page 3, Adama tells Starbuck that Tigh used to be a maverick pilot, just like Starbuck himself. And Adama was the one who reined him in as needed, just as Apollo did for Starbuck. On page 7, panel 5, a Colonial landram can be seen parked on the hangar deck in the background. On page 8, Sheba remarks that they can use the Cylon transport they captured as the exfil vehicle. If she is referring to a transport the reader is supposed to know about, I'm not aware of it; the transport they use looks nothing like the Cylon transport they captured way back in "Risk and Luck". The transport, as depicted here, looks similar to a Cylon Raider, but larger. On page 10, the coordinates given by Xam with the message "APOLLO LIVES" are different than the coordinates he gave in "The Death of Apollo" Part 2. On page 11, Starbuck's rescue team leaves Galactica "ten centars later..." "Centar" is the Colonial term equivalent to one Earth hour.